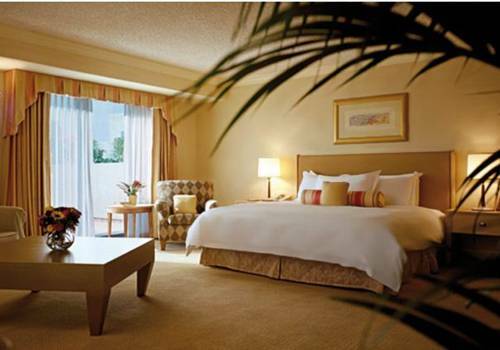 Luxury travel awaits at JW Marriott Santa Monica Le Merigot. Our beachfront hotel provides an unparalleled location on Ocean Avenue near the Santa Monica Pier and Santa Monica Airport. When you're not soaking in the dazzling surrounding area, treat yourself to a pampering session complete with massages and facials at our on-site spa. Encounter spacious settings in our rooms and suites offering plush bedding and flat-panel TVs for your utmost relaxation. Order a delicious meal to your door with our 24-hour room service or enjoy an elegant fusion of French and California cuisine at C zanne. We also offer cocktails and light bites at Le Troquet Patio Lounge. Our active travelers can maintain their workout routine at our fitness center and outdoor pool. Need to host an event? Our 11 adaptable venues provide modern backdrops for your corporate gathering or social soir e. Whether you're in search of a rejuvenating beach vacation or productive corporate trip, awake renewed at JW Marriott Santa Monica Le Merigot. C zanne: Tantalize your taste buds with a unique blend of Californian and French cuisine at our signature on-site restaurant. We provide a private dining room, indoor seating and an outdoor area with views of Santa Monica Beach. Le Troquet Patio Lounge: Sip on one of our delectable cocktails and enjoy flavorful fare at our patio lounge after exploring Ocean Avenue. Our restaurant showcases a stylish atmosphere, perfect for socializing with friends and family or hosting a happy hour with colleagues.